Cribbing: Crib Guard, Halt Cribbing, Chew Stop, Bitter YUCK, Pas-A-Fier! • No Chew Clear: Clear, non-staining formula contains natural ingredients. Non-flammable and contains no petroleum distillates. Can be applied on all wood surfaces, indoors and out. Dries quickly and is not affected by moisture once it dries. Can be applied in wet weather. An economical, effective way to put a halt to chewing and cribbing that doesn't affect the environment or the horse's health. 32 oz with trigger sprayer. ORDER NOW! • Chew Stop: Chew Stop is formulated for application to wood fences and other surfaces to break horses of the wood-chewing habit. Required frequency of application will be dependent on the temperament of the horse, length of the habit, climatic conditions and the type of surface. Use Chew Stop™ to protect fences, corrals, stalls, mangers, gates, posts and trees: also to keep horses from biting and chewing blankets and bandages. Chew Stop has not been tested on vinyl fencing. Hot cinnamon taste helps stop wood chewing habits in horses.Clear liquid won't stain white fences or discolor other painted surfaces. 12.5 oz aerosol ORDER NOW! No ChewaaaaaaaChew Stop, 12.5 oz. CRIBBING SOLVERS: No Chew Clear, 32 oz. CRIBBING SOLVERS: Chew Stop, 12.5 oz. 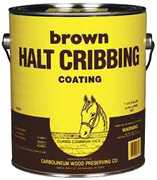 • Halt Cribbing Coating (Brown): Carbolineum Halt Cribbing deter horses from chewing adjoining wood fences, pens, walls, etc. Horses like to chew wood, which can be very harmful, causing bloating and weight loss. Guard your wood, and protect your horses. It lasts longer than paint, looks grand, and contains an active ingredient which is non-toxic and highly disagreeable to 99% of all horses. Not intended for painted or pressure treated wood. Halt Cribbing is cheaper, and far more humane than various restraint systems developed to discourage horse chewing! Brown color. 1 Gallon. ORDER NOW! Crib Guard: CRIB GUARD helps protect your horse from the harmful effects of chewing, gnawing and cribbing! CRIB GUARD is a long-lasting anti-chew spray and gel that is certain to stop your horse from chewing and cribbing! Avoid costly vet bills, dental injuries and digestive tract problems. CRIB GUARD is safe for all surfaces, including: wooden, plastic or metal fences and stalls, blankets, wraps, bandages and any other surface your horse desires to chew. Will not irritate skin and will not harm vegetation. • Crib Guard Spray: 32 oz. ORDER NOW! • Crib Guard Gel: A clear, long-lasting, anti-chew gel with a brush applicator. 16 oz. ORDER NOW! • Chew Proof It! Anti-Chew Spray: Chew Proof It! is an effective anti-chew spray that is definite to stop your pet from chewing. Long-lasting Chew Proof It! Anti-Chew Spray helps protect your shoes, carpet, furniture, etc. and your pet’s teeth, gums and digestive tract from the harmful effects of chewing! Chew Proof It! is safe to spray on shoes, furniture, carpet, fences, baseboards, rugs, blankets, bandages or any other surface your pet desires to chew. Will not harm household plants or vegetation. Non-staining and is safe for all surfaces. 8 oz. ORDER NOW! Crib Guard Spray 32 oz.aaaaaaaCrib Guard Gel 16 oz. CRIBBING SOLVERS: Crib Guard Spray 32 oz. CRIBBING SOLVERS: Crib Guard Gel 16 oz. CRIBBING SOLVERS: Chew Proof It! Anti-Chew Spray 8 oz. Bitter YUCK! No Chew Pet: Bitter YUCK! No Chew Spray has a special water based formula that will not sting or stain. Can be used directly on your pet’s hot spots, fur, bandages, and more. Can be used on plants also. To most pets, Bitter YUCK! has an unattractive taste, making chewing on the specific sprayed object unlikable and reducing the unwanted behavior. Be certain your pet is discouraged by the taste before leaving them alone with the object being sprayed. Bitter YUCK! No Chew Spray with the convenient trigger sprayer makes applying quick and easy. Stops pets from chewing on furniture, paws, wounds, and more. Stops Dogs, Cats & Horses from chewing on: Hot Spots, Summer Itch, Sores, Wounds, Bandages, Furniture, Drapes, Wood, Paws, and Tails and Manes. Bitter YUCK! may be sprayed over topical medication. Bitter YUCK! can be used on or around plants. • BITTER YUCK! No Chew Spray Pet: 8 oz. Spray. ORDER NOW! • BITTER YUCK No Chew Spray Pet: 16 oz. Spray. ORDER NOW! • Bitter YUCK! Pet Outdoor & Indoor Use: 32 oz. Spray. #09007. ORDER NOW! • Bitter YUCK! No Chew Equine: Spray Bitter YUCK! evenly on tails, manes, bandages, or any other surface where chewing is not desired. The water-based formula is non-staining, and will not sting. Can be used on sores, wounds and over topical medication. Safe for use on trees, plants, leather and blankets. Use regularly until undesirable habits are reduced. Do not spray around eyes or nose. STOPS HORSES FROM CHEWING ON: Tails, Manes, Sores, Tack, Stalls, Wounds, Bandages, Trees & Plants, Wood, and Blankets. 32 oz. Spray. #09006. ORDER NOW! • Aller-911 Anti-Lick Paw Spray: Aller-911 Anti-Lick Paw Spray helps to calm itchy paws and contains ingredients to prevent further licking. For use on dogs and cats. Too much paw licking in pets may be a sign of environmental or food allergies. This can lead to yeast infections that can show paw licking as the pet tries to calm the severe itching. 8 oz. Spray. ORDER NOW! CRIBBING SOLVERS: Bitter YUCK! No Chew Spray Pet 8 oz. CRIBBING SOLVERS: Bitter YUCK! No Chew Spray Pet 16 oz. CRIBBING SOLVERS: Bitter YUCK! No Chew Spray 32 oz. • Stay Away: Blended with some of the most bitter extracts in the world. Stay Away tastes so bad it prevents animals from ever wanting to chew, bite, lick or gnaw on something coated with it. Powerful, yet safe. Stay Away is great for dogs, cats, birds, rabbits & deer — and it's safe to use on indoor and outdoor plants. It protects plants, furniture & wounds from injury caused by pet's chewing. Stay Away helps train pets to keep off furnitures, and protects them from poisonous plants. 8 oz. #861107. ORDER NOW! CRIBBING SOLVERS: Stay Away, 8 oz. • Vet's Best Bitter Cherry Spray: Mild on skin, but bitter to the taste. The non-stinging, alcohol-free deterrent of Lemon and Grape Seed extracts deter chewing and licking at skin, stitches or bandages. It's clear and non-staining, plus it smells great even though it tastes unpleasant. 7.5 oz. #10090. ORDER NOW! Ingredients: Proprietary Bittering Agents in a Deionized Water Base, Grapeseed Extract, Lemon Extract and Natural Bitter Cherry Flavor. CRIBBING SOLVERS: Vet's Best Bitter Cherry Spray, 7.5 oz. • Bitter YUCK! No Chew Spray for Cats: Clear, non-sticky, and easy to apply Bitter YUCK! will halt unwanted animals from chewing and gnawing on any number of problem areas. Inexpensive and non-staining. Can be used indoors and outdoors. Bitter YUCK! is WATER BASED unlike other alcohol based products that can cause stinging, so it can be applied to wounds or bandages. Bitter YUCK! Helps stops pets from chewing on paws, hot spots, wounds, drapes, leg wraps, manes and tails. 8 oz. ORDER NOW! Active Ingredients: Rosemary (0.5%), and Bittering Agent (0.075%). Inert Ingredients: Water and Sodium Bicarbonate. CRIBBING No Chew Spray for Cats 8 oz. • Anti-Lick Strip Equine Bandages #235: Anti-Lick Strip Equine adhesive bandages are made with natural Cayenne Pepper blend to discourage horses from repetitively nibbling affected areas or chewing protective wraps. They also help relieve problems stemming from anxiety, boredom or other behavioral issues. By deterring horses from bothering these "problem spots," they'll have a chance to properly heal. Anti-Lick Strip Equine has a medical grade adhesive so it should never be applied directly to the horse's skin. Contents include (10) 10 x 3 inches Bandages per pack. #235. ORDER NOW! 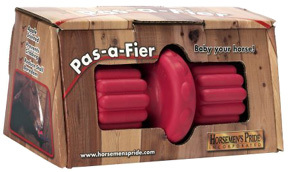 Pas-A-Fier: Pas-A-Fier Stall Toy is an easy and smart way to avoid stall boredom. This sturdy horse toy features an enticing apple scent to keep the horse's attention. Great for reducing cribbing, this handy toy is great for stall use or can be thrown out in the pasture. Made from advanced polymer for extra-strength. Rotating device allows the horse to massage its gums.. Mounting hardware included. Measures 9 × 6 × 4 inches, 3 pounds. ORDER NOW!